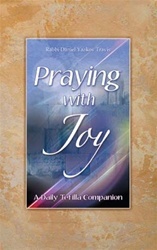 If you want to elevate your prayers, to infuse your daily living experience with joy and spiritual connection, then look no further than this wonderful volume. Don't let its diminutive, compact size deceive you--it is packed full of rich insights, powerful perspectives, and ideas that will have you praying with joy and new understanding. From the very first page, the author's words grip the reader, leading the way to a beautiful and uplifting journey through the daily prayers.